Whatstandwell Festival is back again, and its bigger and better than ever. The 15th family-family festival will run on June 22 and 23 at Hankin Farm. Activities include live music, fun run, yoga, circus skills workshop, willow weaving, pottery and chainsaw art. The fun kicks off on the Friday night with a concert headlined by Chesterfield indie duo The Natterjacks who will be supported by May Contain Nuts and indie rock covers band The Fordhams. Five bands will be performing on the Saturday in a concert headlined by indie/rock covers band Facsimile. 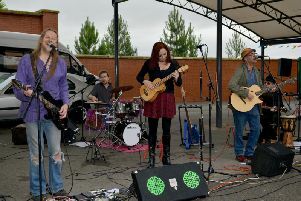 Also on the bill are rock covers band No Damger, indie rock covers outfit Barnie Rubblz, prog rock group Uneven Planet from Wirksworth and alternative rock grunge band Marvin’s Revenge, also from Wirksworth. Leftychris (pictured) will headline the acoustic stage on Saturday. Chris has been gigging with the band Left Hand Drive since 1996 but has also started a solo act with mainly original songs stripped down to one guitar and one voice performing as a singer songwriter. Expect to hear songs from his solo album Humble Moon. There is a fun run Saturday morning with registration at 10am, one and three mile routes available, both routes are off road and through beautiful countryside. There will be a warm up in advance with Natural Born Runners and afterwards a cool down yoga session. For those who don’t want to drive home, camping is available on the farm campsite for a small additional fee, payable direct to the farm. Toilets and free showers are available on site, and caravans, camper vans and tents can all be accommodated. Admission for the weekend is £15 for adults including a free glass, £10 for Saturday and £5 for Friday night, accompanied teenagers are half price and there is free entry for children. Tickets are available from www.whatstandwell.org.